As a Canadian I know a thing or two about fluctuating currencies and travel. The Canadian dollar has had its wild swings. In July of 2011 it reached $1.05 versus the US dollar but by January of this year it had dropped to $.68. That’s a range of $.37. Yikes! And yet, still I travel. To be fair, Canadians are accustomed to this kind of currency swing. Our norm is somewhere around $.75 per US$ but it changes frequently. This causes us to watch exchange rates carefully and not take the value of our currency for granted. While it has an impact on when, where and how I travel, it doesn’t affect the fact that I travel. So here are my travel currency tips for when the value of your currency is on a high or a low. The relative strength of your currency. You may want to adjust the timing of your trip based on the trend in the value of your currency. The cost to get there. It may be worth spending more to get to a destination where the cost of being there is very low thanks either to your strong currency or to a low cost of living. The cost of travel on the ground. Whether high or low, how expensive it is to stay can be far more significant than your currency exchange rate. Monitor your currency’s trend. If your currency is on a historical high against a dream destination it’s time to go. If it’s not but you could see it improving, hold off. Travel your home country. 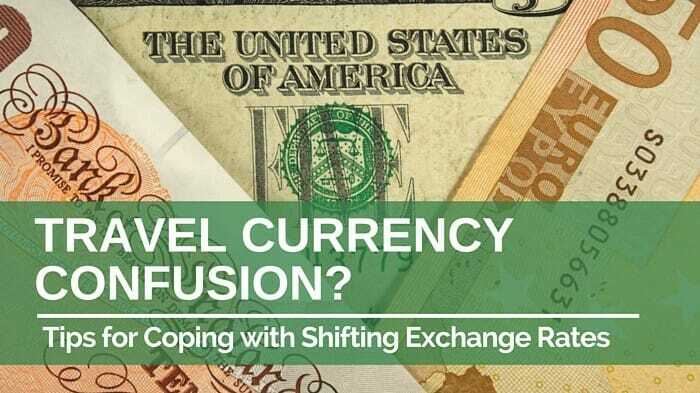 If your currency is suffering against others it may be time to travel at home. After all, I never met a destination I didn’t like. Use rewards points. If your currency has dropped it’s the perfect time to use rewards points. The value of a points stay steady as your currency declines. Time your purchase of cash. If you know that you’re traveling to a destination in the next few months, or even a year off, buy your currency when it seems like a good deal. Not sure? Hedge your purchases by buying every couple of months and you’ll get, more or less, the annual average – no big win but no big loss either. Get the best exchange rates. If you haven’t bought your foreign currency in advance of leaving don’t buy it at the airport or any other currency exchange booth. They usually offer poor rates. Wait till you arrive at your destination and use an ATM machine or a local bank in town. Avoid fees for withdrawing cash. As travelers worry about a few percentage points lost in a currency exchange they often don’t notice the fees their bank is charging as they withdraw cash. Carry a bank card that does not charge you to withdraw cash from a foreign ATM. I have a premium bank account that, with a minimum balance, waives the foreign ATM fee. You could also choose a bank that is part of the Global ATM Alliance. Either way could save $5 per ATM withdrawal. Carry the right credit card. Another way travelers lose on currency exchanges is with their credit cards. Foreign transaction fees run from 1.5% to 3%. Carry a credit card with no foreign transaction fees. For Americans, the Chase Sapphire card is good bet for both travel rewards and no foreign transaction fees. As a Canadian I travel with the free Amazon.ca card which, again, has no foreign transaction fees.